Your kids have seen the movie and now they’re begging you for a themed party right? I’m talking about that super popular movie with those really large animals. 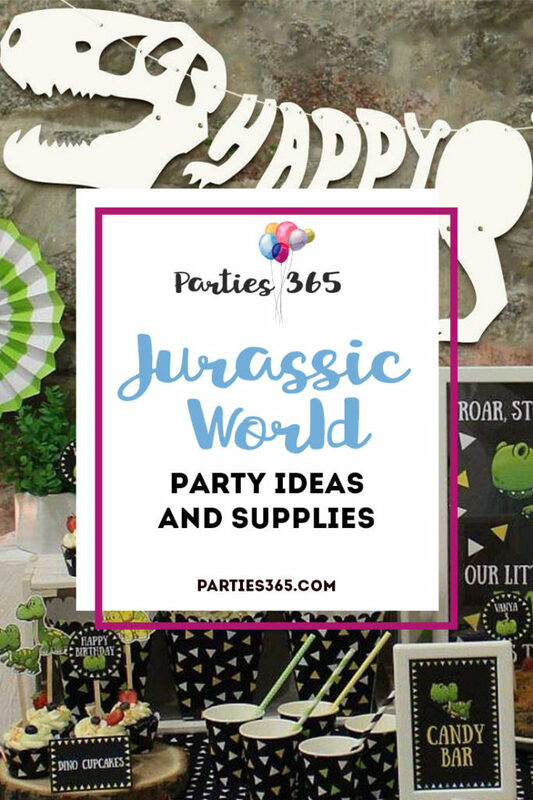 Are you looking for Jurassic World Party Ideas and Supplies? I thought so! Everyone in my family has seen it but me. What’s up with that?! But I’ve heard nothing but good things about it and can’t wait to grab my popcorn, soda and movie ticket. 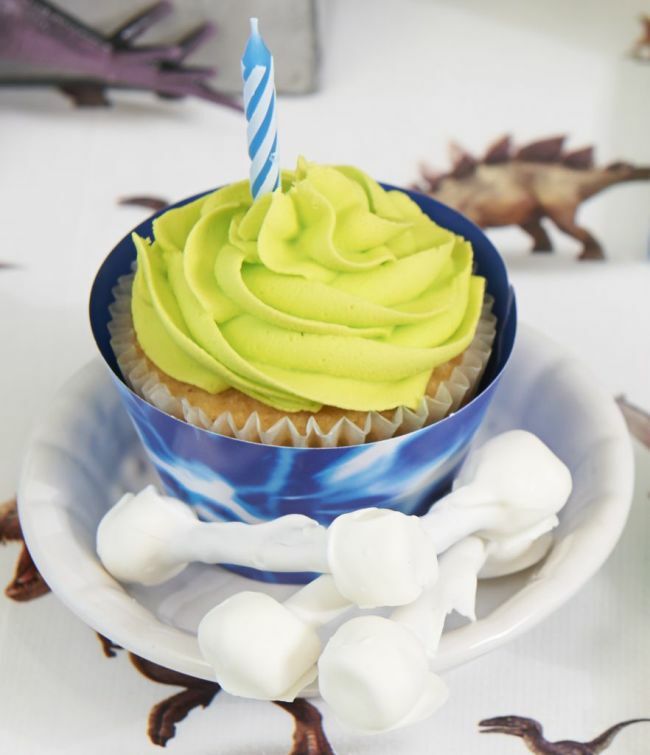 Until then, check out these awesome dino-worthy party ideas. 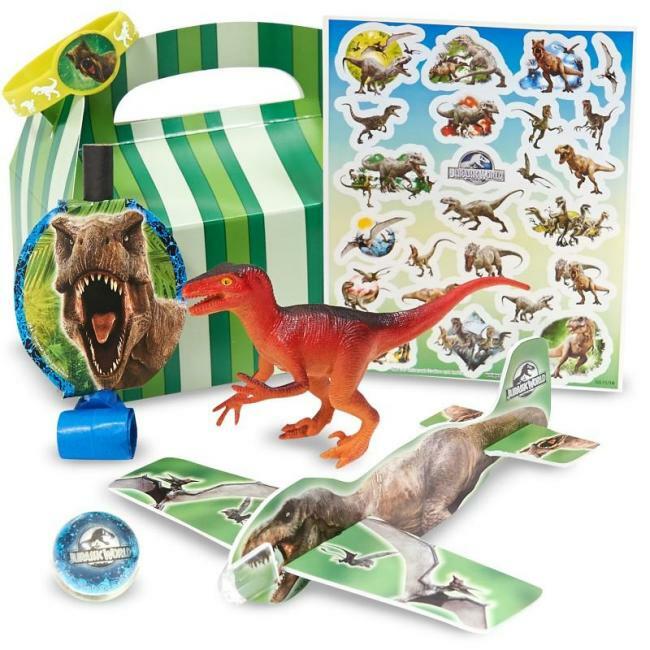 Choose from a Jurassic World Party in a Box which comes with lunch and dessert plates, cutlery, cups and napkins or order the supplies separately. 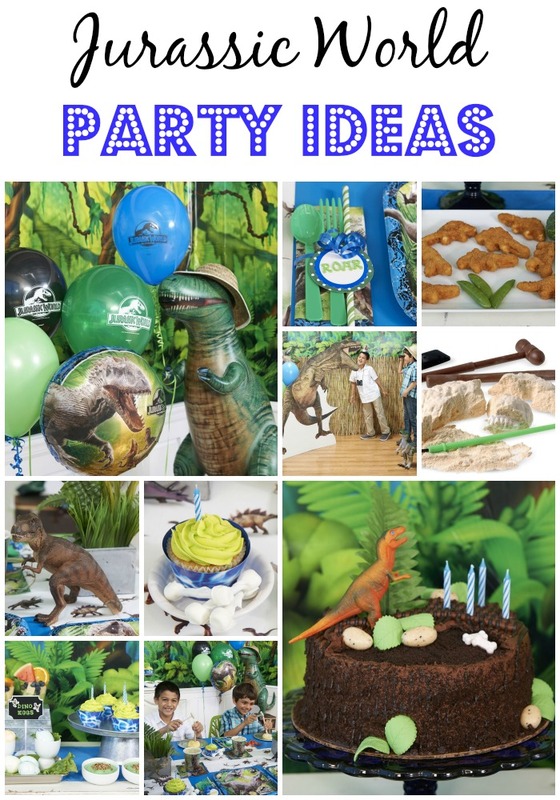 It’s easy to create a party that suits your Jurassic dream! 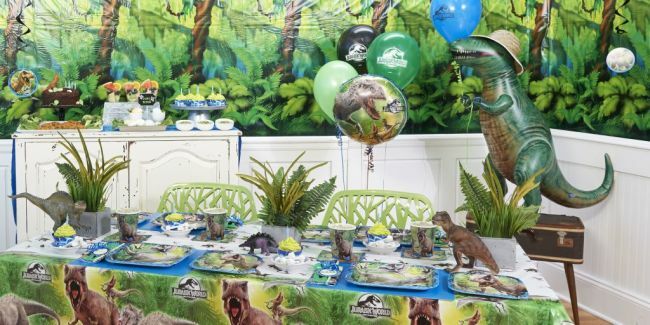 The Jurassic World tablecover features the favorite dinosaurs from the movie and it really sets the stage to build the rest of the party on. 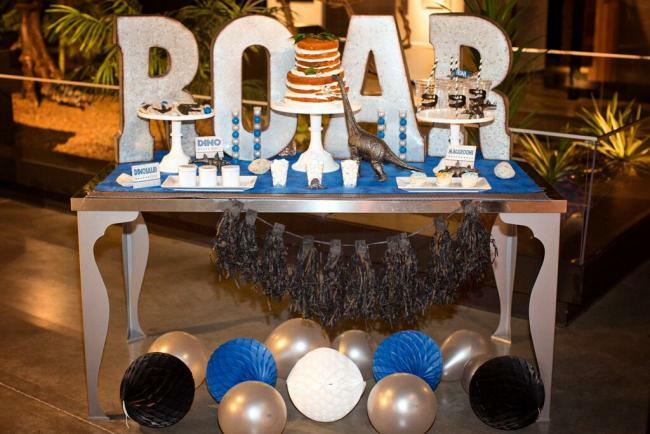 We love how they added the ferns to the table – it really helps create a prehistoric mood! What’s a party without balloons right? 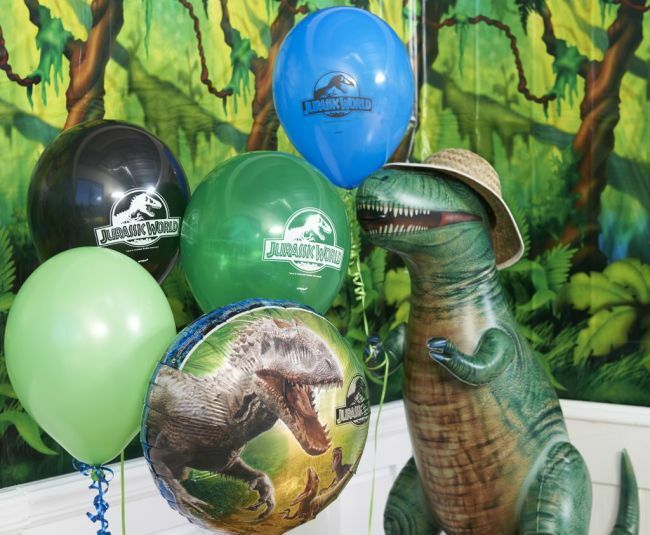 How about a 38″ foil Raptor balloon, a 68″ T-Rex air walker balloon, or a Deluxe Jurassic World Balloon Decoration Bundle that has a little bit of everything? 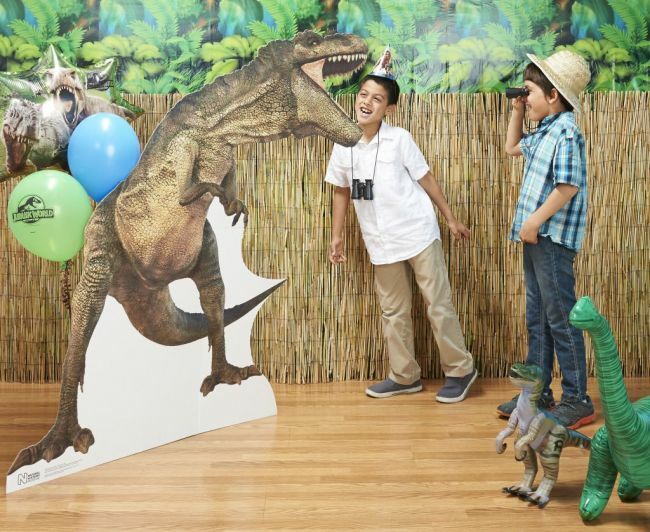 Step up the party decor a notch with a 5 foot tall T-Rex or Velociraptor standup. Set up an entire scene using the standup, a bamboo backdrop and balloons for the kids to pose in front of for pictures. 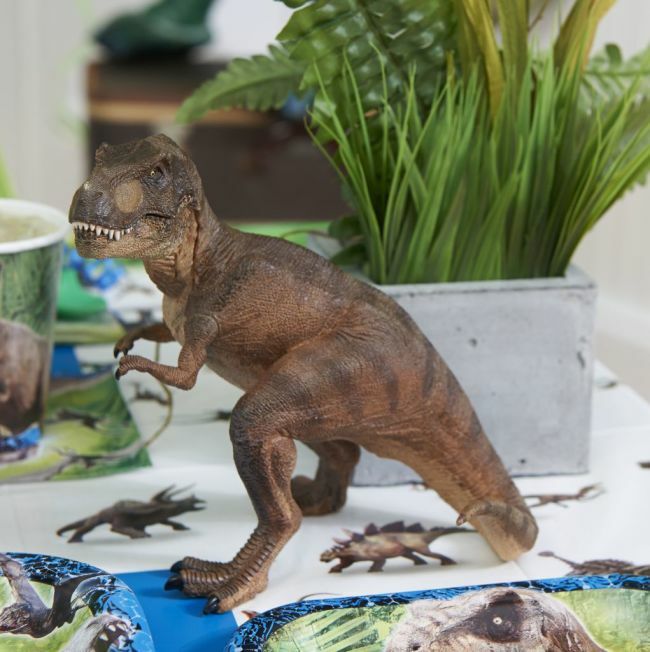 Decorate the party table with Jurassic World dinosaur figurines. 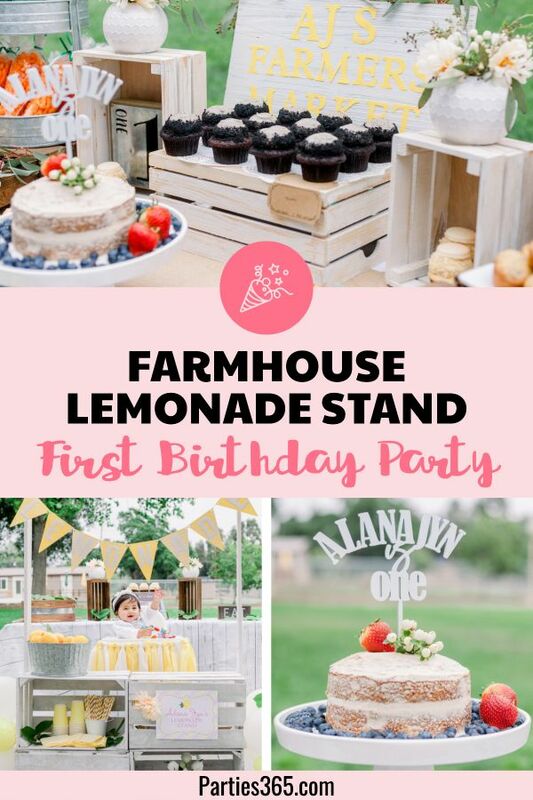 You can also use them to decorate the cake, cupcakes, give out as door prizes and a number of other fun things. 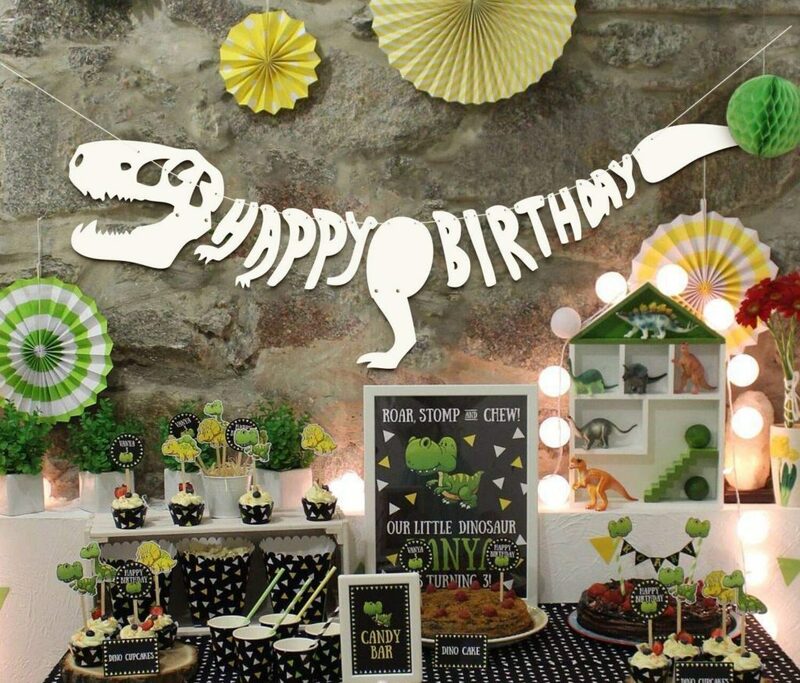 We also love this adorable dinosaur Happy Birthday banner! Add some faux palm leaves and some other tropical greenery on your mantel or above the dessert table. 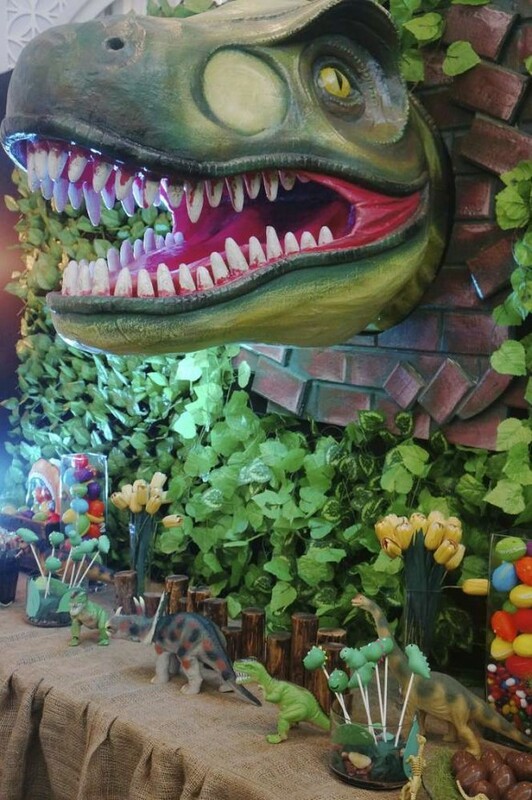 How amazing is this giant T-Rex head above the feature table at this dinosaur party we spotted on Catch My Party?! 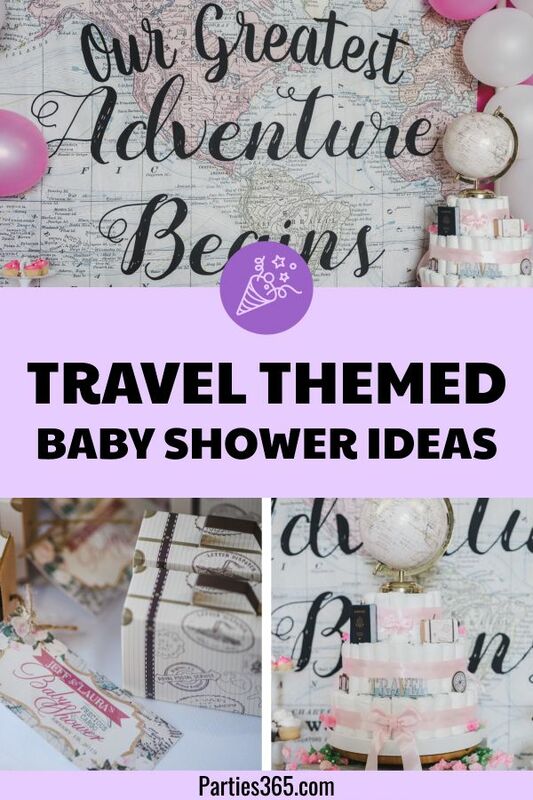 This is sure to capture your guests’ attention! Finally, we loved the galvanized steel R-O-A-R featured at this unique movie premier party featured on Spaceships and Laserbeams. 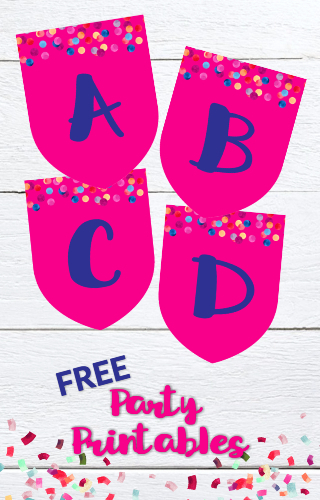 You could pick up similar letters at Hobby Lobby! Decorate a store bought chocolate cake, like the one below, and add on your own decorations. You can also make cupcakes and use cool wrappers. 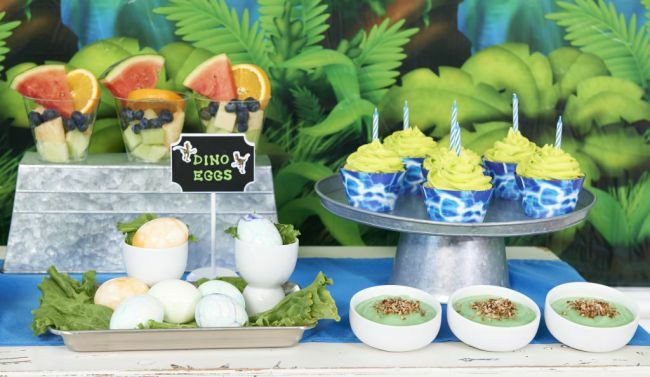 Serve hard boiled eggs, fruit cups and dinosaur shaped chicken nuggets. 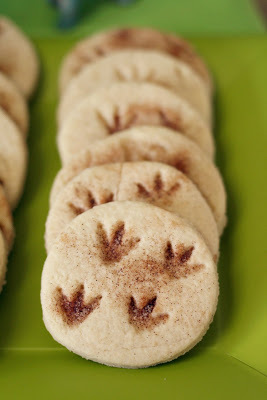 And how perfect are these dino footprint sugar cookies we spotted on Buggie & Jellybean? 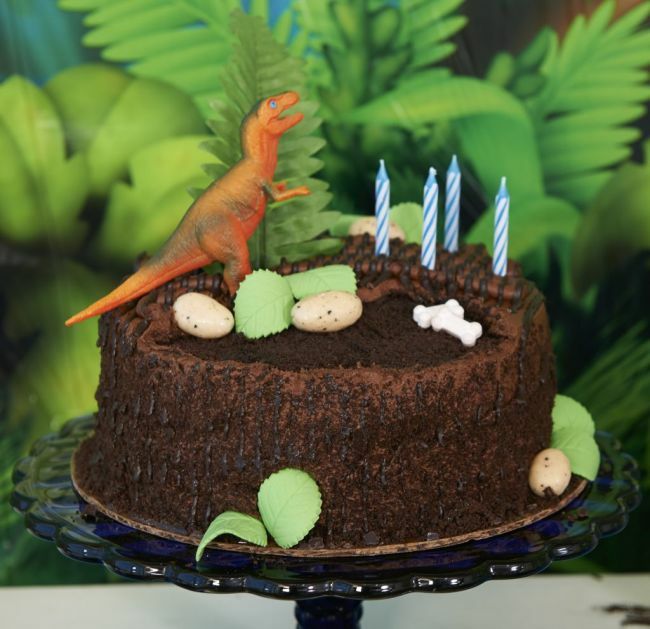 Use a miniature dinosaur figurine to make the footprints and fill them with cinnamon and sugar, then bake! 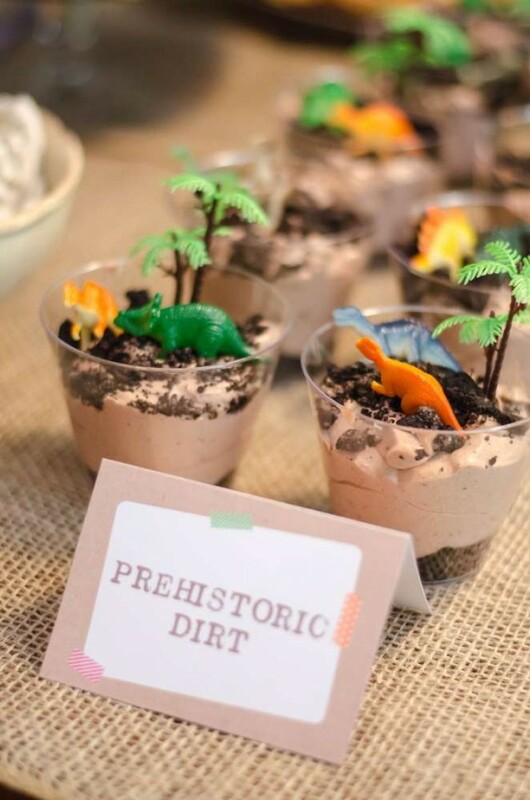 Another simple, but clever snack idea are these Prehistoric Dirt Pudding Cups from Catch My Party! 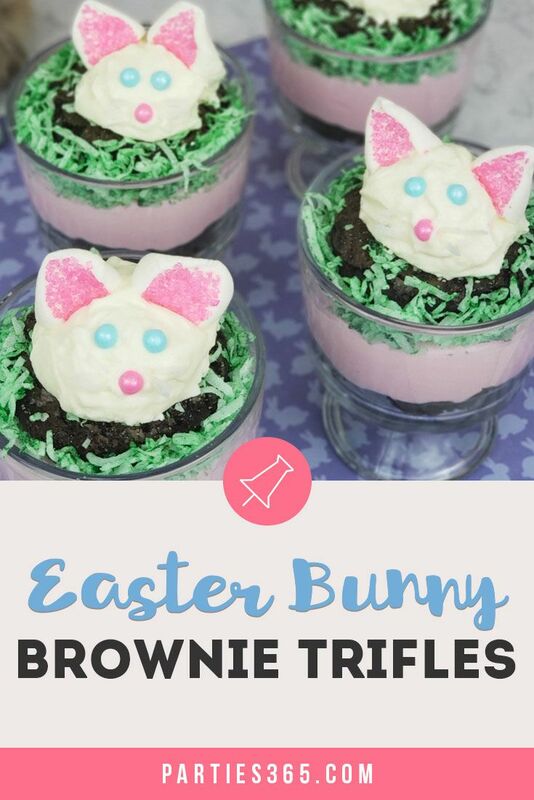 Just add Oreo crumbles, mini-dinos and some tropical greenery on top! Finally, let’s talk favors! Send your guests home with Jurassic World figurines, Jurassic World Pez dispensers, Jurassic World gliders and Sticker and Tattoo sets in these Jurassic World favor bags. And if you want to give guests at the party something to remember, be sure to have an adult surprise everyone mid-party in this giant inflatable dinosaur costume! Just for fun, right? !